I read that WordPress 2.3 Release Candidate 1 is available. So, I want to be the first few risk takers and upgrade my newest blog. It was breezy and easy with no bugs that I notice. The only difference that I see is the tags we can insert at the bottom. 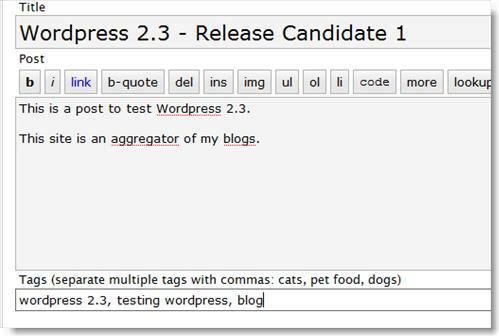 I didn’t read up what they offer in the new [tag]Wordpress 2.3[/tag] because some of the stuffs are too technical to me. Dare to try? You can get the link to download from here. I am not going to test it on my bigger blogs and will wait out for the final version. I’m really afraid that more than a few plugins will be broken. Many of GamerZ’s plugins for ratings, email, and polls are not 2.3 ready so I will wait to upgrade. i think i will stay with the current version i have, dont want to run into trouble with plugin incompatibility.